Choose any six individual ICEcard packs of your choice and pay for only four! protect yourself and the ones you love! Plain and simple, an ICEcard is a card you carry with you everywhere you go. If you are ever in an emergency situation and are unable to speak for yourself, your ICEcard holds all the important information required by first responders to ensure your medical needs are properly and safely met. It also holds the contact details of the people you’ve selected to be notified – just as the card says - in case of emergency. Cards are supplied in packs with matching Key Rings and stickers which help to alert first responders that you are carrying an ICEcard. The card is made of durable PVC with a fully writable reverse surface. Card dimensions are 54 x 86mm with a thickness of only 0.76mm (Same as your bank card). The ICEcard has been designed with the advice of first aid professionals, and with simplicity in mind. The words ‘IN CASE OF EMERGENCY’ are displayed in bright, bold text along the top right hand corner of the card along with the International (ISO) symbol for First Aid. 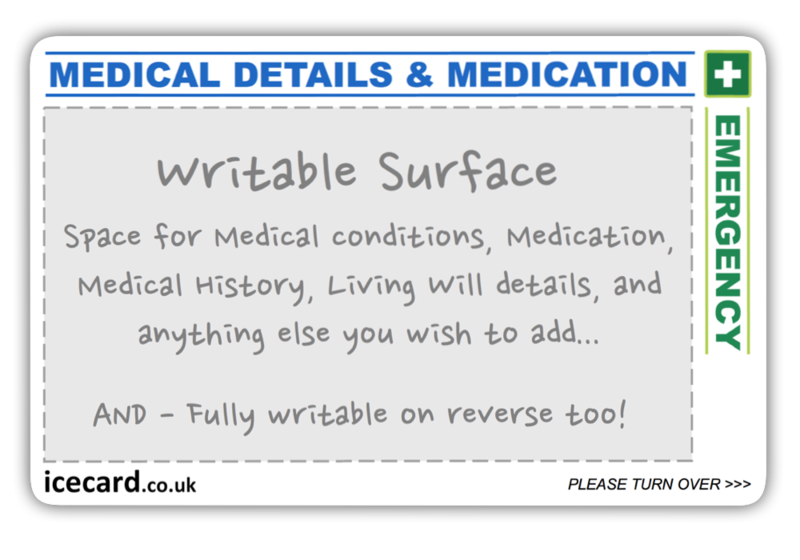 Do you have multiple medical conditions or a complex medical history? Ensure first responders get all the information they need in an emergency. Our Add-On Card is available as an optional extra with this product. It has a large write-on panel on the front of the card and a complete writable surface on the reverse. The Add-On card provides extra space for additional medical details, medication, medical history, or to write whatever you think might be important for a first responder to know if you were in an accident or needed emergency care. ICE Cards are an excellent product. You can carry them easily, you can write on them easily, Easily changed and updated. A superb buy.